just plain weird. this just plain freaks me out. Wallpaper and background images in the Unbelievable club tagged: strage weird eye nose people freaky image photo. The angle of the finger going in and coming out again makes me suspect a photoshopper... And the fact that this site has other photoshopped images. It's still very, very creepy. And if I can verify it, it will be even creepier. WTF is that, that can't be reall, maybe photoshop! Okay Photoshopped or not that's just WRONG! This is photoshopped. Look closely at his pointer finger and you will actually see tht it is closed as part of his fist. 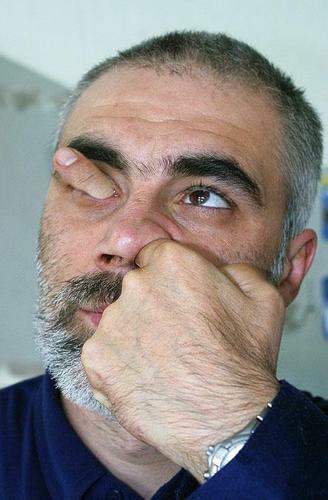 the finger coming out of his eye is really another finger. That is if the finger is even real. He must have had an itch.